Anna University, Chennai: On 5th February 2018, Anna University decalred 1st Semester Results for both UG and PG Students. Results reports Shows that only 31.93% sutdents have cleared in all papers. Out of 1,13,298 Students appeared for the Exam, Ony 36,179 Students have cleared all the papers. Anna University Conducted Semester Examination for all 1st year Students who joined in the 2017. Semester Exams were conducted in the 1st week of Janaury 2018 and results were decalred yesterday. Results were sent through SMS to all Students and also through portal coe1.annauniv.edu, coe2.annauniv.edu & aucoe.annauniv.edu portal. Anna University revised the Syllabus pattern for all those students who joined B.E in the year 2017. Python Programming Subject was introduced instead of C Programming and there was other minor Changes in syllabus as well. 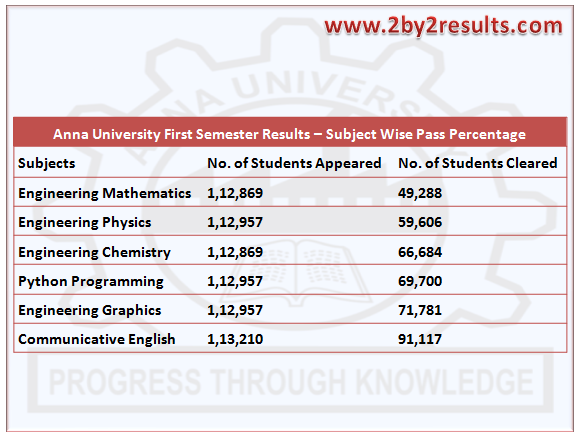 Hence, Students and parents were eager to Check Anna University results for B.E/B.Tech 1st Semeter results. Below in the table you can get the Number of Students who appeared for the Exam as well as Number of Students who cleared the papers (subjects wise). The tabl shows low pass percentage especially in Engineering Maths, Engineering Chemistry and in Engineering Physics. For those Colleges who have not paid admission Fees, Results are kept withheld. Students after choosing their preferred colleges in Counselling, pay admission fees in respective instituion, and enroll themselve. But Admission fees are not paid by Colleges to University. Hence, Once Fees are paid, University will release the results for all those 20 colleges. Out of 570 Colleges, only 550 Affiliated (self-financing) Colleges have paid the fees says the Anna University official. Anna University decalred the Results for Government Aided Colleges last week, in which only 65% of the Students cleared all papers.